Mary Ann Knight was born July 1, 1838 near Beaverdam Creek, the present day site of Ray City, GA Her parents, John Knight and Sarah Sally Moore were pioneer settlers of the area, then situated in Lowndes County, Georgia but cut into Berrien County in 1856. Go any ordained minister of the gospel Judge of the Superior Justice of the Inferior Court Justice of the peace or any person by the Laws of this State authorised to Celibrate these are to authorise and permit you to join in the Venerable State of matrimony this William, A. Jones of the one part and this Mary Ann Knight of the other part according to the constitution and laws of this state and according to the rites of your church provided there be no lawful cause to obstruct the same and this shall be your authority for so doing given under my hand and seal this the 1st day of November 1856. Mary Ann and W.A. Jones settled on a farm next to her brother, William Washington Knight in the new county of Berrien, in the vicinity of present day Ray City, GA. Other nearby neighbors included James A. Knight, Reverend Nathan Talley, William R. Brandon, and James M. Baskin. The farm of Allen Jones and Kiziah Knight Giddens Jones was in the same area. In 1861 Mary Ann and William had a son, William Malachi Jones. When the Civil War got underway, William A Jones joined the Berrien Minute Men, along with Mary Ann’s brothers and other men of Berrien County. This was a company of volunteer infantry organized by Mary Ann’s father, Levi J Knight. The Berrien Minute Men were mustered in as Company G, 29th Georgia Infantry, and William A. Jones was enlisted as a private on August 1, 1861 at Savannah, GA. Four months later the company muster rolls note that he was “absent with leave.” Later service records show that he died of measles in Berrien County on January 18, 1862. The location of his grave is unknown. Mary had two children by William A. Jones, the youngest, Adam, apparently born after his father’s death. Adam Jones was deaf and dumb, birth defects with a high probability for a baby whose mother is infected with measles in the early weeks of pregnancy. For five years, the widow Jones raised her children as a single parent. On March 25, 1866 she married Green Bullard in Berrien County, GA.
William “Green” Bullard was born February 1, 1829 in Georgia, son of Amos Bullard and Cynthia Lastinger. He came with his parents from Waynesboro, Burke County, GA to Lowndes County, GA some time in the 1840s. Green Bullard, age 21, was enumerated in 1850 in Lowndes County, GA in the household of his father, Amos Bullard, along with his minor siblings, Martha and Mary. Also in the Bullard home was 14-year-old Candis Leaptrot. Next door was John Knight, his wife Sarah, and children William J. Knight, Levi J. Knight (known as Jr. to avoid confusion with his uncle General Levi J. Knight), James A. Knight, Mary Ann Knight, Henry Harrison Knight, Sarah A. L. Knight, and Kiziah A. L. Knight. According to Census agriculture schedules, Amos Bullard’s farm was valued in 1850 at $400, consisting of 490 acres of which 30 acres were improved. The Bullard farm inventory included $20 of farming implements and machinery, one horse, 15 hogs, 100 bushels of Indian corn, one 400 lb. bale of cotton, 60 bushels of peas and beans, 10 bushels of sweet potatoes, 200 pounds of butter, and $50 worth of butchered meat. Green’s dwelling was next door to the farm of his brother, James Bullard, who owned 490 acres with 32 under cultivation. Green had a personal estate of $500, but apparently no land as yet, for he does not appear in the 1850 Census non-population schedule for agriculture. It seems probable that he was helping his brother with farm labor. After the Civil War commenced Green Bullard went to Nashville, GA with his nephew Alfred Anderson and signed up on March 4, 1862 with the Berrien Light Infantry, which was being formed at that time. Bullard fought dysentery and Typhoid pneumonia while in the army (see Green Bullard Fought Sickness in the Civil War), but was also present with his unit for significant battles at The Wilderness (May 5–6, 1864), Spotsylvania Court House (May 8–21, 1864), North Anna (May 23–26, 1864), Cold Harbor (June 1–3, 1864, Petersburg Siege (June 1864-April 1865, and Cedar Creek (October 19, 1864.) By January, 1865 Bullard was too weak to continue fighting. He was sent to the hospital with dysentery and was furloughed. Less than a month later the War ended. With the end of the Civil War, Green Bullard returned to home and farm. Within a year, he married Mary Ann Knight in Berrien County, Georgia. Mary Ann Knight was “the girl next door” from Green Bullard’s younger days. As mentioned above, Mary Ann Knight was the daughter of John Knight and Sarah Sally Moore, who were the neighbors of Amos Bullard, Green’s father. She was born July 1, 1838 in Rays Mill, Lowndes (nka Berrien) County, Georgia. She was also the widow of William A. Jones. Her husband served in the Berrien Minute Men in the war, and was among those who succumbed to ravaging illnesses of camp life; he died of measles in Berrien County on January 18, 1862. Mary had two children by William A. Jones, the youngest, Adam, apparently born after his father’s death. Adam Jones was deaf and dumb, birth defects with a high probability for a baby whose mother is infected with measles in the early weeks of pregnancy. Green Bullard and Mary Ann Knight were joined on March 25, 1866 in Berrien County, GA. The ceremony was performed by William Patten, Justice of the Peace. 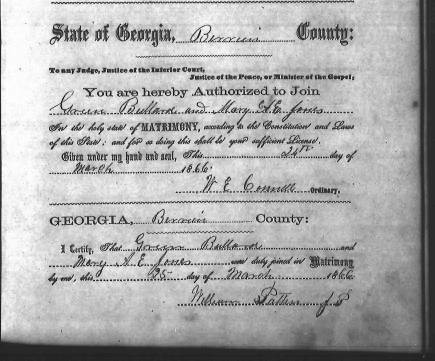 Marriage certificate of Green Bullard and Mary A. E. Knight, March 25, 1866, Berrien County, GA. In 1867 Green Bullard signed the standard loyalty oath required to restore voting rights of southerners during Reconstruction. 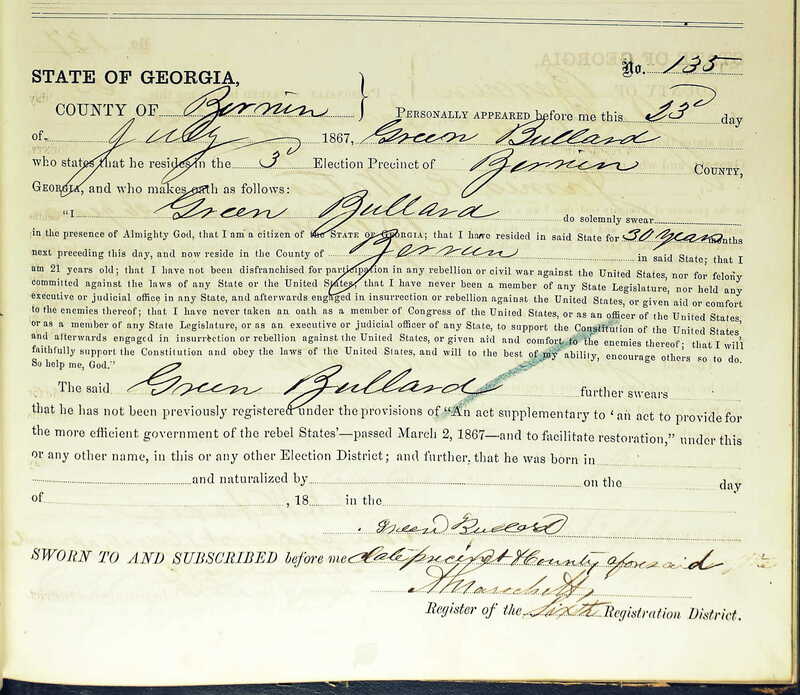 The census of 1870 enumerated Green Bullard’s blended family in the 1144 Georgia Militia District of Berrien County, GA, the Rays Mill District. The Bullard household included Green and Mary, their three year old daughter, Sarah Bullard, Mary’s sons William Malachi Jones and Adam Jones, and Green’s widowed sister, Celia Bullard. Mary and Celia kept house while Green and William worked the farm. The records of appointments of U.S. Postmasters show that Green Bullard was appointed postmaster of Knight’s Mill (later known as Rays Mill) on August 3, 1868. Bullard held the position until June 29, 1871 when the Knight’s Mill post office was discontinued. Berrien County Property Tax records of 1872 show Green Bullard owned 980 acres including all of lots 420 and 469 in the 10th land district. The land was valued at $1300 total. The records show he owned “other property” valued at $379, for an aggregate estate of $1679. Green Bullard employed one “hand” to help with the work. By the following year, Green Bullard had expanded his operation to 10 hands. The tax records also noted a ten year old male in his household was deaf and dumb. He had $270 cash or liquid assets, and his total property was valued at $2742. By 1878 his personal estate also included $742 worth of livestock. The Census of 1880 found Green Bullard still employing his step-son Malachi Jones to work on the farm. Step-son Adam Jones was not enumerated in the Bullard household at this time but would appear in later census records. 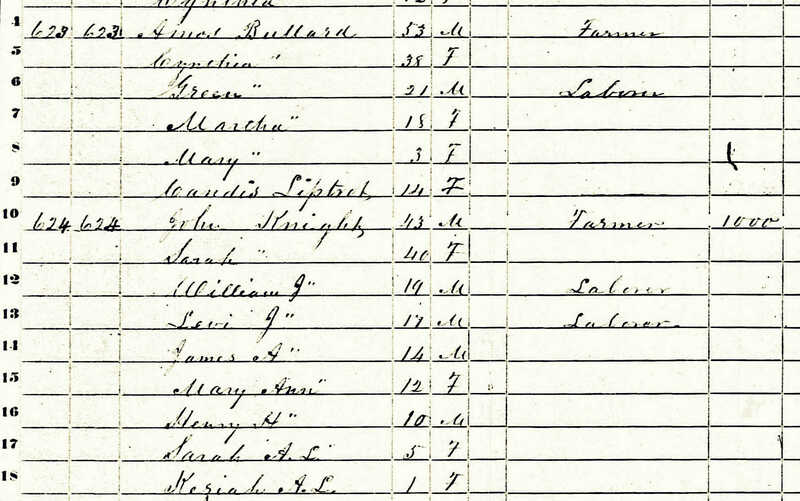 The Census enumeration noted that three daughters of Green Bullard and Mary Ann Knight, Sally (13), Susan (9), and Fannie (5) were all at school. They attended the King’s Chapel School, located just across the county line, in Lowndes County. Among the other students at King’s Chapel was Jesse Shelby “Dock” Shaw, who would later marry Susie Bullard. The 1880 Census – Agricultural Production Schedule shows the Green Bullard farm consisted of 125 acres of land tilled, fallow, or grass (pasture or meadow), and 850 acres of unimproved woodland and forest. In 1879 Bullard had planted 17 acres in Indian corn which produced 200 bushels, 28 acres of oats produced 330 bushels, and 22 acres of cotton which produced about 8 or 9 bales. He had another 2 or 3 acres planted in sugar cane. Bullard owned one horse, one mule, and one ox. He had 16 milk cows and 54 other cattle. His stock dropped 13 calves and he purchased another 29. He sold 7 calves and two died. He had 45 sheep on hand and had 11 lambs dropped. Ten sheep died of disease. He sheared 36 fleeces for 100 pounds of wool. His other livestock included swine and poultry. The farm, land, fences and buildings were valued at $1,400, farming equipment and machinery at $15, and live stock at $694. In the previous year, Bullard had purchased about $350 dollars worth of fertilizer. His total farm production value was estimated at $600. 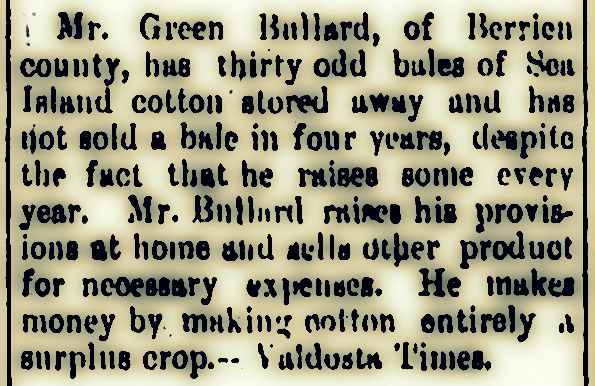 Mr. Green Bullard, of Berrien county, has thirty odd bales of Sea Island cotton stored away and has not sold a bale in four years, despite the fact that he raises some every year. Mr. Bullard raises his provisions at home and sells other product necessary for expenses. He makes money by making cotton entirely a surplus crop. — Valdosta Times. By the fall of 1907, Green Bullard was in his 78th year and the health of the old veteran was failing. 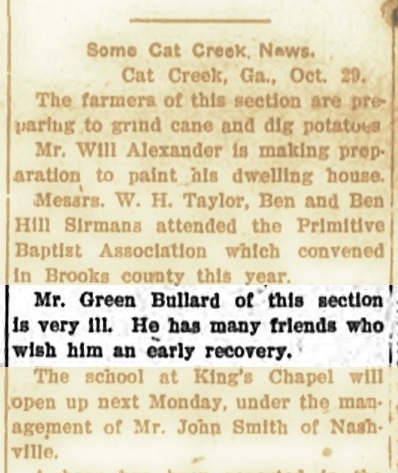 November 2, 1907 Valdosta Times reports Green Bullard is very ill.
Mr. Green Bullard of this section [Cat Creek] is very ill. He has many friends who wish him an early recovery. Green Bullard died on Friday, November 15, 1907. He was buried at Beaver Dam Cemetery, Ray City, Berrien County, GA. Grave of Green Bullard, Beaver Dam Cemetery, Ray City, GA.